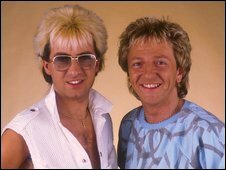 Black Lace hit Agadoo, named the worst song of all time by a panel of music writers, is being re-released 25 years after it hit number two. The song, kept off the top by George Michael's Careless Whisper in 1984, won the title in a 2003 Q magazine poll. The video for Agadoo (Mambo 2009 remix) was directed by Bruce Jones, who played Coronation Street's Les Battersby. Black Lace singer Dene Michael said: "With all the doom and gloom in the world, this is just what we need." Actor Jones also appears in the video along with fellow former Coronation Street actor Kevin Kennedy, who played Curly Watts in the soap. Michael is joined on the record, released on Monday, by new member Ian Robinson. Michael's original partner in the duo, Alan Barton, died in a bus crash in 1995. The band's other hits include Superman, Do The Conga and I Am The Music Man. The Q magazine panel summed up the 1984 original as "magnificently dreadful". "It sounded like the school disco you were forced to attend, your middle-aged relatives forming a conga at a wedding party, a travelling DJ act based in Wolverhampton, every party cliche you ever heard," the panel added.